North American corn farmers certainly have their share of insect pests to worry about. Between corn borer, earworm, armyworm, and rootworm, there isn’t much of the plant that isn’t vulnerable to attack by at least one of these insects. 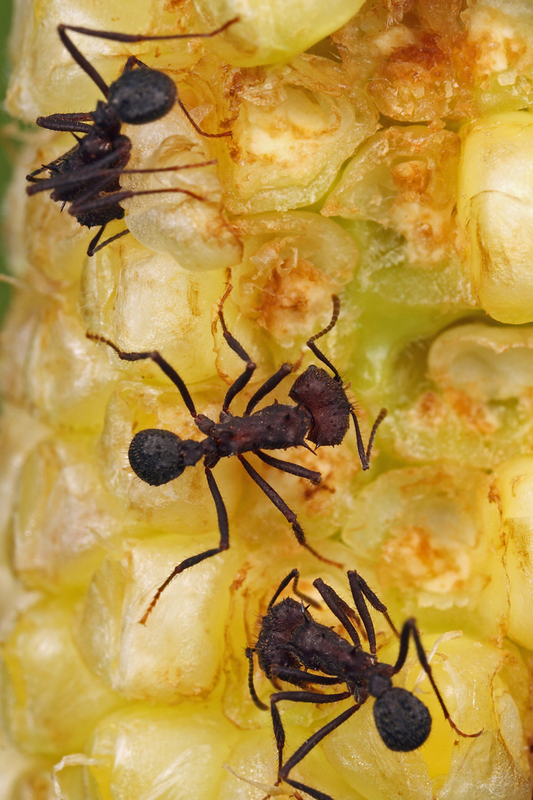 Argentina corn farmers have all this and more—have you ever seen ants attacking corn? I took these photographs yesterday in a corn field in western Buenos Aires Province showing leafcutter ants dining on the developing kernels of late-planted corn. Okay, “dining” may not be the proper word, as they are not actually eating the kernels, but rather harvesting them to bring them back to their “hormiguera” (ant nest) for cultivation of the fungi on which they feed. 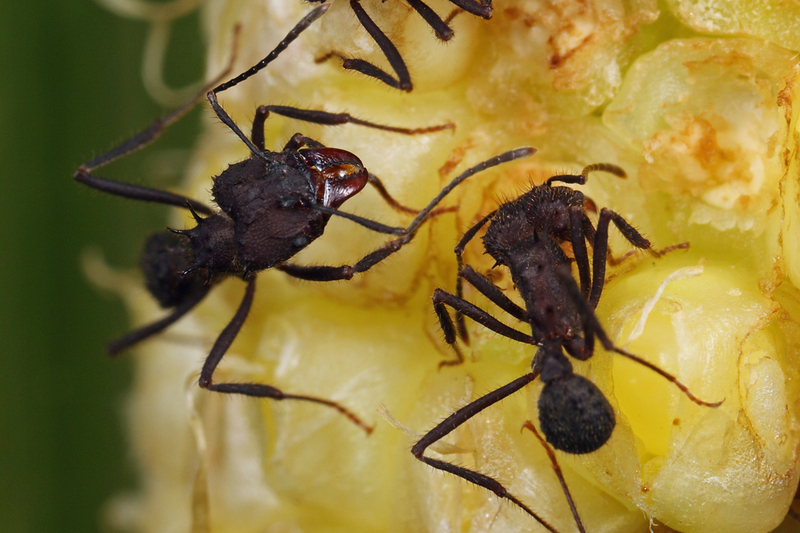 The four pairs of spines on the pro-mesonotum and narrow distal antennal segments suggest this is a species of Acromyrmex, three species of which are mentioned as pests of corn in Argentina (A. lundii, A. striatus, and A. lobicornis). Of these, the individuals in these photos seem to best match AntWeb’s photos of Acromyrmex lundii, but that is just my guess. This entry was posted in Formicidae, Hymenoptera and tagged ants, Argentina, economic pests, entomology, insects. Bookmark the permalink. How neat! Well…not for the farmers…but great shots. Will you be traveling to Patagonia by any chance? I saw some fascinating beetles when I was there. Either way, I look forward to your Argentine photos. My itinerary is still a little undecided, but I’m leaning towards spending some free time in nature preserves in Entre Rios – there should be many bichos this time of year. Ick but in a good way. Haven’t checked out the ID yet, but you’re probably right.